Push the switch to close. Pressing the switch again while the power back door is closing will cause it to open again. 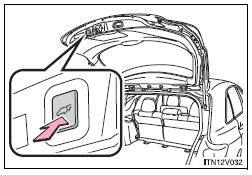 However, the reverse operation cannot be performed for the first second after pressing the switch to close the door. The back door can be opened even if it is locked. Lock the back door again when you leave the vehicle. The back door will not lock automatically after it has been opened and then closed. A buzzer sounds and the emergency flashers flash twice to indicate that the back door has been opened/closed.